After Jesus had risen from the dead, He made many appearances to His disciples. On one occasion. Jesus appeared to His disciples at the Sea of Tiberias. One day, Simon Peter told Thomas, Nathanael, James and John that he is going to the Sea of Tiberias to catch fish. So Thomas, Nathanael, James and John decided to go along with Simon Peter. They got into a boat and try to catch fish. They were fishing all day long but they still couldn’t catch any fish. So they throw the fishing net at the right side of the boat and they caught such a large amount of fishes that it was too heavy to pull into the boat. When Simon Peter heard John said that it was the Lord Jesus, he took off his outer garment and swam to the shore. 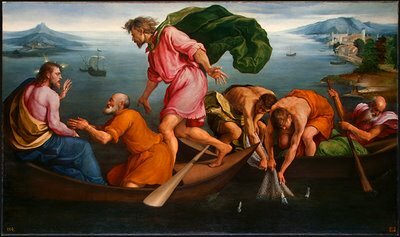 But Thomas, Nathanael, James and John came to the shore in a small boat with the fishes. Simon Peter helped to pull in the net of fishes to land. Simon Peter counted the numbers of fishes in the net and it was 153 big fishes. Although there are so many fishes in the fishing net, it was not broken. Jesus said to them, “Come and have breakfast.” No one asked Him if He is Jesus because they know it is Jesus. This is the third time that Jesus had showed Himself to His disciples.